Stricter cigarette packaging rules have come into force in the UK in a fresh bid to put people off smoking. Under the new tobacco laws, all cigarettes must be sold in standardised green packaging - previously described as “the ugliest colour in the world” by researchers - specifically designed to discourage young people from taking up the unhealthy habit. The packets must be 65 per cent covered with health warnings, including graphic images such as depictions of tobacco tar-stained-lungs. Under the rules, packs must contain at least 20 cigarettes meaning smokers will be unable to buy cheaper packs of 10 once the law comes into force. Menthol cigarettes are now also only sold in packs of 20, as part of a longer plan to phase out the flavoured cigarettes completely by 2020. The complete ban also includes skinny "lipstick-style" cigarettes and flavours such as vanilla and strawberry. The initial phase out began last May when cigarette packaging was standardised under new rules, designed to prevent young people taking up the habit. Tobacco companies were at the time given a year to sell old stock and fully implement the changes under the directive. An estimated 700,000 premature deaths are caused by smoking each year, and cancer charities are backing the measures. Deborah Arnott, the chief executive of Action on Smoking and Health (Ash), said that overall, the UK is one of the countries with the fastest declining proportion of smokers, but rates among the most disadvantaged remain high. She said: "If this is to change then a priority for the next Government must be to publish a new tobacco control plan with tough new targets, focused on tackling health inequalities." However smokers' group Forest argues the new laws treat British tobacco consumers like "naughty children" and would make no difference to public health. The group’s director Simon Clark said: "The new regulations treat adults like naughty children. They infantilise consumers by attacking freedom of choice and personal responsibility. "The new regulations are a disgraceful attempt to denormalise both the product and legitimate consumers. "There's no evidence they will have the slightest impact on public health." 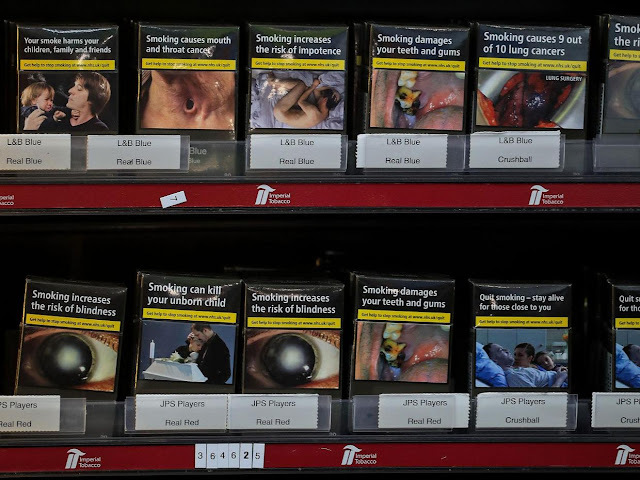 Last week, Philip Morris, the maker of Marlboro cigarettes, was accused of using an “immature trick” to bypass the new strict plain packaging laws by rolling out durable tins looking like ordinary cigarette packets, ahead of the ban.